The historic centre of Malacca was inscribed on the World Heritage List on 7 July 2008 together with George Town, the capital of Penang. 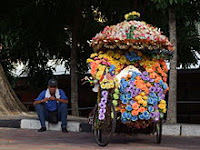 The Malays, settled in Malacca since 1400, form the largest community and have a distinctive culture. 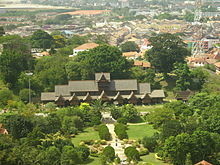 Two of the most important museums in Malacca are the Baba Nyonya Heritage Museum and the Malacca Sultanate Palace Museum. Malacca is well-known for its food; Malay dishes include ikan asam pedas, sambal belacan and cencaluk. Belacan, a Malay variety of shrimp paste, is prepared from fresh shrimp of a species known as keragu in Malay. These are mashed into a paste and dried in lumps, pounded and formed into large balls, dried again for a week or so, wrapped in plastic and stored for future use. It is in this form that most of these blachan balls are sold. Belacan is used as an ingredient in many dishes, or eaten on its own with rice. A common preparation is sambal belacan, made by mixing belacan with chili peppers, minced garlic, shallot paste and sugar and then fried. The aroma from the frying mixture can be unpalatable to Westerners who have not become accustomed to it, but is an absolute delight to the Asian connoisseur. Malacca is also famous for satay celup. Raw fish and meat are skewered onto sticks which is then cooked in a peanut sauce; this is often sold in individual sticks. Malacca's ethnic Portuguese population are the descendants of Portuguese colonists from the 16th and 17th centuries. Even to this day, many of the traditions originating with the Portuguese occupation are still practised, i.e. "Intrudu" from Portuguese word "Entrudo" (a water festival that marks the beginning of Lent, the Catholic fasting period), "branyu" (traditional dance), "Santa Cruz" (a yearly Festival of street celebrations). Nyonya-Baba cuisine is a fusion of Chinese (mostly southern Hokkien or Fujian influence), Portuguese, Dutch, Indian, British and Malay cooking with most dishes being spicy in nature. Peranakan dishes include Itik Tim (a soup containing duck and salted vegetables), Ayam Pong Teh (chicken casserole with salted brown-bean sauce usually served with potatoes) as well as the famous Nyonya Laksa. Chicken Rice Ball is another dish popular with domestic Chinese tourists. The Portuguese colonists contributed dishes like Devil's Curry and Portuguese egg tarts to the town's cuisine. Ikan Bakar (roasted fish) restaurants in Umbai, Serkam and Alai are also popular. There is also a sizeable amount of Sikhs residing in Malacca, and Sikhs from Malacca and abroad congregate in the gurdwara (Sikh temple) situated in Jalan Temenggong during the last weekend of May, to commemorate the death of its former priest, Sant Baba Sohan Singh Ji, who was elevated to a saint upon passing away. Visitors are welcome but are advised to follow rules and common practices within the premises. Typical vegetarian punjabi cuisine will be served to everyone visiting the gurdwara. 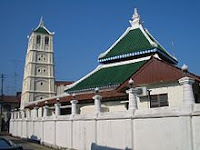 Kampung Kling Mosque: Kampung Kling Mosque is one of the oldest mosques in Malaysia. It was built around 1784 with the influence of Sumatran architecture. Firstly, there’s no Byzantium dome around. It was replaced by a tiered pyramidal roof. Secondly, just look at the minaret which is structured like a pagoda. There's even Chinese Character carved on the side roof of the mosque. Malacca (dubbed The Historic State or Negeri Bersejarah among locals) is the third smallest Malaysian state, after Perlis and Penang. It is located in the southern region of the Malay Peninsula, on the Straits of Malacca. It borders Negeri Sembilan to the north and the state of Johor to the south. The capital is Malacca City, which is 148 km south east of Malaysia's capital city Kuala Lumpur, 235 km north west to Johor's largest city Johor Bahru and 95 km north west to Johor's second largest city Batu Pahat. This historical city centre has been listed as a UNESCO World Heritage Site since 7 July 2008. Although it was the location of one of the earliest Malay sultanates, the monarchy was abolished when the Portuguese conquered it in 1511. The Yang di-Pertua Negeri or Governor, rather than a Sultan, acts as the head of state now. According to a popular legend, Parameswara was resting under a tree near a river while hunting, when one of his dogs cornered a mouse deer. In self-defence, the mouse deer pushed the dog into the river. Impressed by the courage of the deer, and taking it as a propitious omen of the weak overcoming the powerful, Parameswara decided on the spot to found an empire on that very spot. He named it 'Melaka' after the tree under which he had taken shelter. Another version of the story says that Parameswara chose the name 'Malacca' from the Tamil word 'mallakka' which means upside down or on ones back. Old illustrations of the scene where the mousedeer kicks the dog shows the dog falling on its back into the river, hence the inspiration. Before the arrival of the first Sultan, Malacca was a fishing village inhabited by local Malays. Malacca was founded by Parameswara, also called Iskandar Shah or Sri Majara, the last Raja of Singapura (present day Singapore) following a Majapahit attack in 1377. He found his way to Malacca around 1400 where he found a good port—it was accessible in all seasons and on the strategically located narrowest point of the Malacca Straits. In collaboration with allies from the sea-people (orang laut), the wandering proto-Malay privateers of the Straits, he established Malacca as a major international port by compelling passing ships to call there, and establishing fair and reliable facilities for warehousing and trade. Mass settlement of Chinese, mostly from the imperial and merchant fleet occurred during the reign of Parameswara in the vicinity of Bukit China ("Chinese Hill"), which was perceived as having excellent Feng Shui (geomancy). Sultan Iskandar Shah died in 1424. 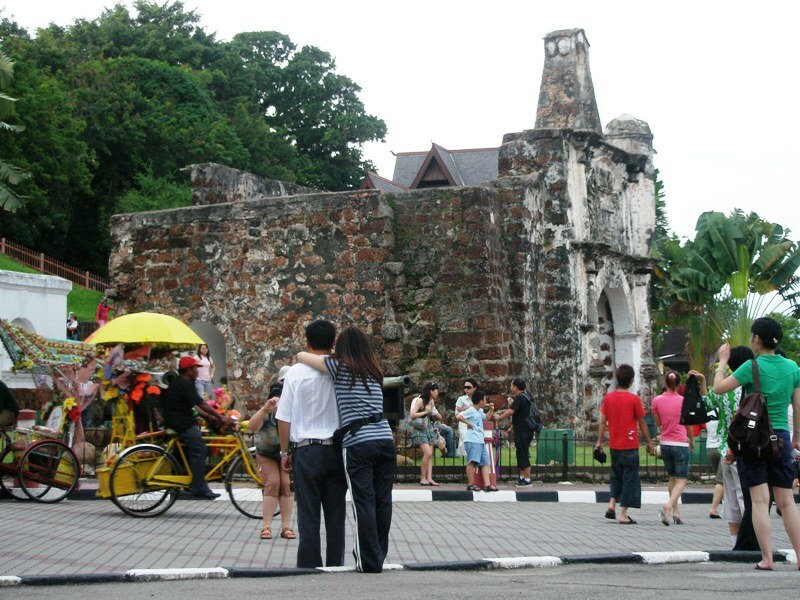 The prosperity of Malacca attracted the attention of the Siamese. Attempts at invasion made in 1446 and 1456, however, were warded off by Tun Perak, the then Bendahara (a position similar to Prime Minister). The development of relations between Malacca and China was a strategic decision to ward off further Siamese attacks. pore) and was succeeded by his son, Sri Maharaja also called Sultan Muhammad Shah. Because of its strategic location, Malacca was an important stopping point for Zheng He's fleet. To enhance relations, Hang Li Po, a princess of the Ming Emperor of China, arrived in Malacca, accompanied by 500 attendants, to marry Sultan Manshur Shah who reigned from 1456 until 1477. Her attendants married the locals and settled mostly in Bukit China (Bukit Cina). (See Zheng He in Malacca). Scholars have disputed Hang Li Po's status, as the Ming Chronicles in China do not mention her as a princess in the Chinese court of the Ming Dynasty. At the time of the arrival of the Sultan's envoy, the reigning Ming Emperor was Jingtai Emperor. Since records of his reign were expunged following Tianshun'a ascension to the throne in 1457, it is likely that records of Hang Li Po's status might no longer exist. Other historical texts do mention that she was a princess in the court of the Yongle Emperor(1402–1424). During its prime, Malacca was a powerful Sultanate which extended its rule over the southern Malay Peninsula and much of Sumatra. Its rise helped to hold off the Thai's southwards encroachment and arguably hasten the decline of the rival Majapahit Empire of Java which was in decline as Malacca rose. Malacca was also pivotal in the spread of Islam in the Malay Archipelago. After Vietnam destroyed Champa in the 1471 Vietnamese invasion of Champa, they proceeded to engage in hostilities with Malacca with the intent of conquest. The Chinese government sent a censor, Ch'en Chun, to Champa in 1474 to install the Champa King, but he discovered Vietnamese soldiers had taken over Champa and were blocking his entry. He proceeded to Malacca instead and its ruler sent back tribute to China. Malacca again sent envoys to China in 1481 to inform the Chinese that, while returning to Malacca from China in 1469, the Vietnamese attacked them, castrating the young and enslaving them. The Malaccans reported that Vietnam was not in control of Champa but sought to conquer Malacca, but the Malaccans did not fight back due to lack of permission from the Chinese to engage in war. The Chinese Emperor scolded them, ordering the Malaccans to strike back with violent force if the Vietnamese attacked. In April 1511, Afonso de Albuquerque set sail from Goa to Malacca with a force of some 1200 men and seventeen or eighteen ships. They conquered the city on August 24, 1511. It became a strategic base for Portuguese expansion in the East Indies. Sultan Mahmud Shah, the last Sultan of Malacca, took refuge in the hinterland, and made intermittent raids both by land and sea, causing considerable hardship for the Portuguese. 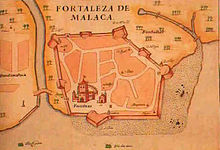 In the meantime, the Portuguese built the fort named A Famosa to defend Malacca (its gate is all that remains of the ruins at present). "In order to appease the King of Ayudhya (Siam), the Portuguese sent up an ambassador, Duarte Fernandes, who was well received by Ramathibodi." in 1511. Finally in 1526, a large force of Portuguese ships, under the command of Pedro Mascarenhas, was sent to destroy Bintan, where Sultan Mahmud was based. Sultan Mahmud fled with his family across the Straits to Kampar in Sumatra, where he died five years later. The Jesuit missionary Francis Xavier spent several months in Malacca in 1545, 1546 and 1549. In 1641, the Dutch defeated the Portuguese in an effort to capture Malacca, with the help of the Sultan of Johore. 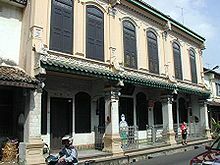 The Dutch ruled Malacca from 1641 to 1798 but they were not interested in developing it as a trading centre, placing greater importance to Batavia (Jakarta) on Java as their administrative centre. However they still built their landmark, better known as the Stadthuys or Red Building. serkam.homestay. Picture Window theme. Theme images by urbancow. Powered by Blogger.